A defense of a version of the higher-order thought (HOT) theory of consciousness with special attention to such topics as concepts and animal consciousness. Consciousness is arguably the most important area within contemporary philosophy of mind and perhaps the most puzzling aspect of the world. Despite an explosion of research from philosophers, psychologists, and scientists, attempts to explain consciousness in neurophysiological, or even cognitive, terms are often met with great resistance. In The Consciousness Paradox, Rocco Gennaro aims to solve an underlying paradox, namely, how it is possible to hold a number of seemingly inconsistent views, including higher-order thought (HOT) theory, conceptualism, infant and animal consciousness, concept acquisition, and what he calls the HOT-brain thesis. He defends and further develops a metapsychological reductive representational theory of consciousness and applies it to several importantly related problems. Gennaro proposes a version of the HOT theory of consciousness that he calls the "wide intrinsicality view" and shows why it is superior to various alternatives, such as self-representationalism and first-order representationalism. HOT theory says that what makes a mental state conscious is that a suitable higher-order thought is directed at that mental state. 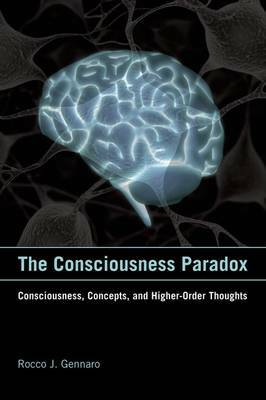 Thus Gennaro argues for an overall philosophical theory of consciousness while applying it to other significant issues not usually addressed in the philosophical literature on consciousness. Most cognitive science and empirical works on such topics as concepts and animal consciousness do not address central philosophical theories of consciousness. Gennaro's integration of empirical and philosophical concerns will make his argument of interest to both philosophers and nonphilosophers.